This week I fired some ochres and bones at my studio in Conestoga. I love this process, and was excited to see the results of heating a few different soils and clays from here in the village in my outdoor firing pit. I’d also been given a large bag of bones last fall from a friend who had collected them during his many hikes that year, so I also made some bone black. I have a pretty amazing firing pit just outside my studio door! 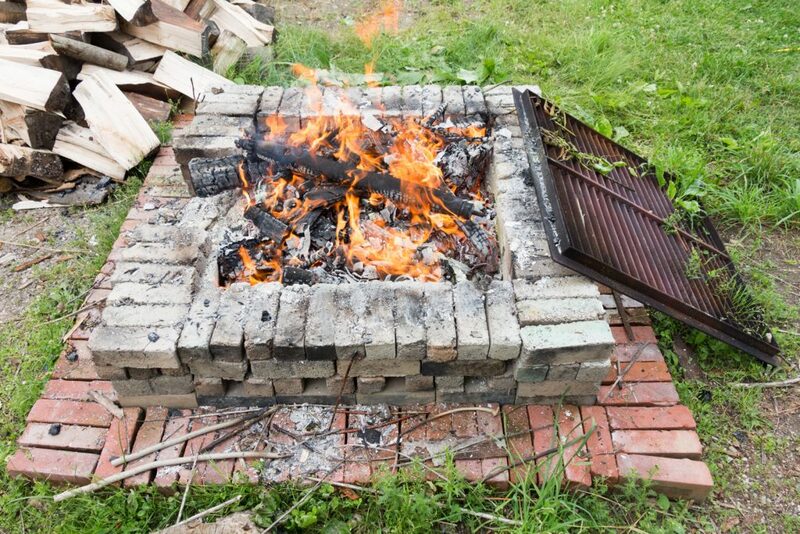 Years ago, after they had knocked down the old smelting foundry across the river, the owner found a stash of some original firebricks and gave them to me. They are unlike anything I’ve seen—a composite of nickel and concrete which hold and radiate the heat well. Using what I was given, I’ve made a pit roughly a metre (3 feet) square which holds more than enough coals for my work. Getting up early, I had the fire going well before breakfast — it always amazes me that striking a single match can create a roaring blaze! 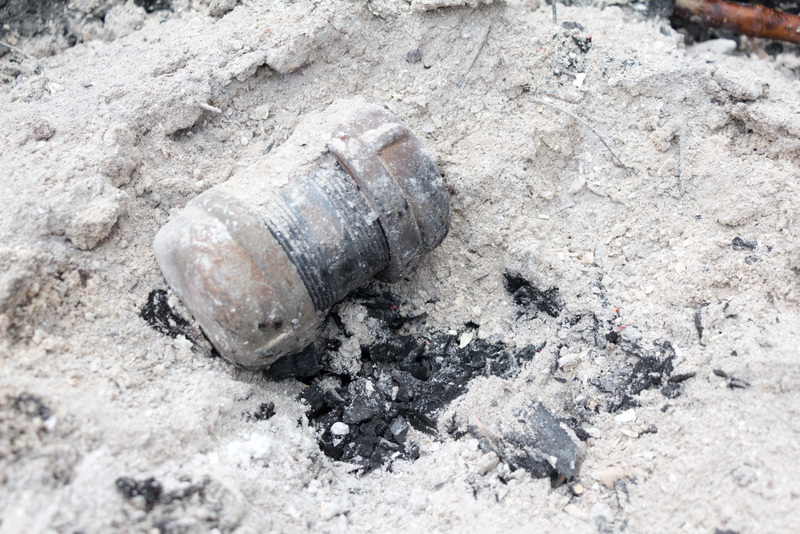 Once the pit had dried out, and there was a good layer of coals on its floor, I placed my first three pigment canisters in the centre of the fire. 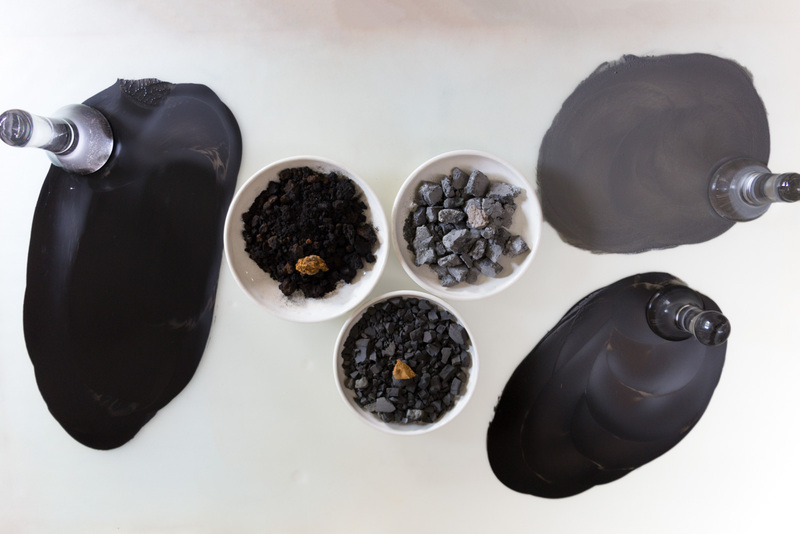 Each of these was filled with a different earth from around the rivers of Conestoga—one of bright ochre, one of bog ore, and one of grey clay. After that I continued to add wood to the fire, and while there were a few times when the height of the flames made me momentarily uncomfortable, overall the fire stayed in the pit. The heat in the pit got more intense during the morning than I had intended … Peering in-between the burning logs at one point I caught a glimpse of the canisters glowing a bright cherry red (perhaps going onto an orange-red!). This meant that the canisters where being heated to somewhere between 1000°C to 1100°C (1832°F to 2012°F). That was a lot hotter than I would usually go to create a burnt ochre, but since there was nothing I could do I simply had to wait and wonder how the final colours might turn out. 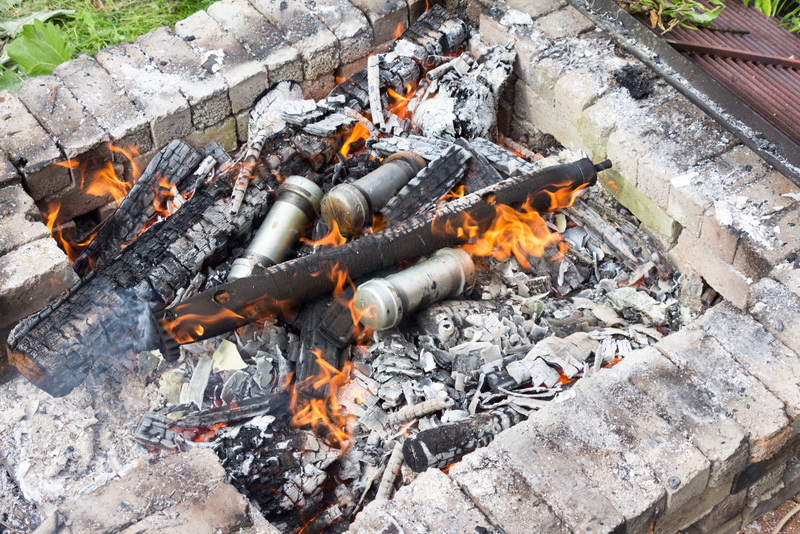 It was early afternoon before my wood supply was exhausted and the fire burned down to coals. Now I was ready to add the bones. 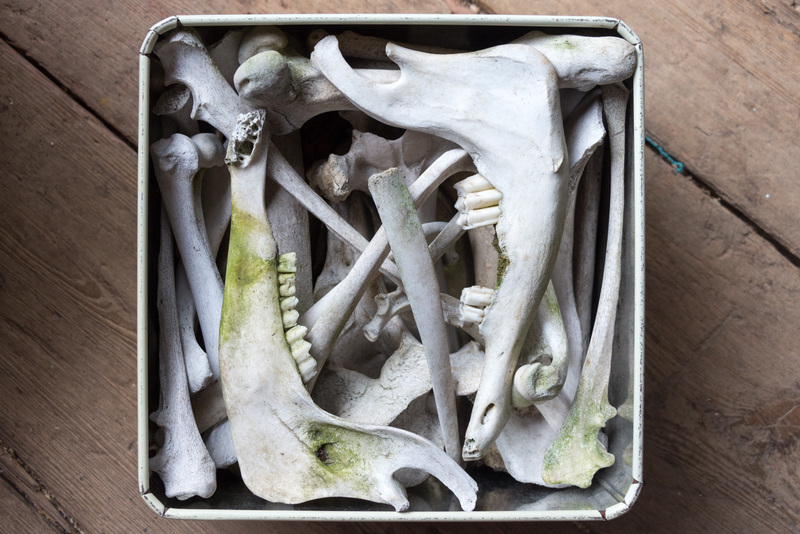 Ever since spending a week in Alberta with artist Betty Spackman burning her Found Wanting exhibition from relics of the animals we eat into bone black and ash (you can read about that in my Found Wanting Black post) something has awoken in me about arranging the bones I use. The arrangement of each shape and type of bone into a series of patterns feels like a way to honour these animal remains. With the pattern complete, the tin was sealed and placed on the fire. I watched the heat creep up the tin—turning the originally bright yellow paint black—before black whiffs of smoke began to escape and a familiar, acrid smell came to my nose as the bones burned. After a while, the smoke and flames subsided and it was time to burn my last ochre. 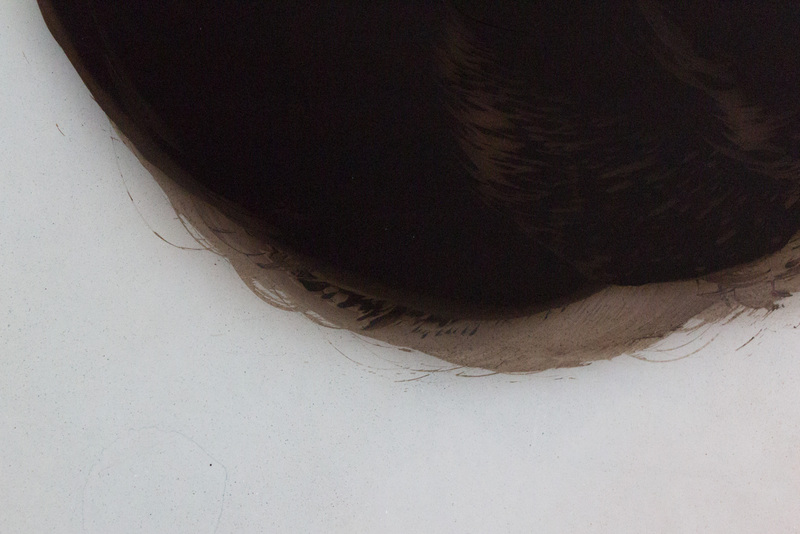 I filled a small canister with my best Eby Ochre from the river and made a little hole in the coals. 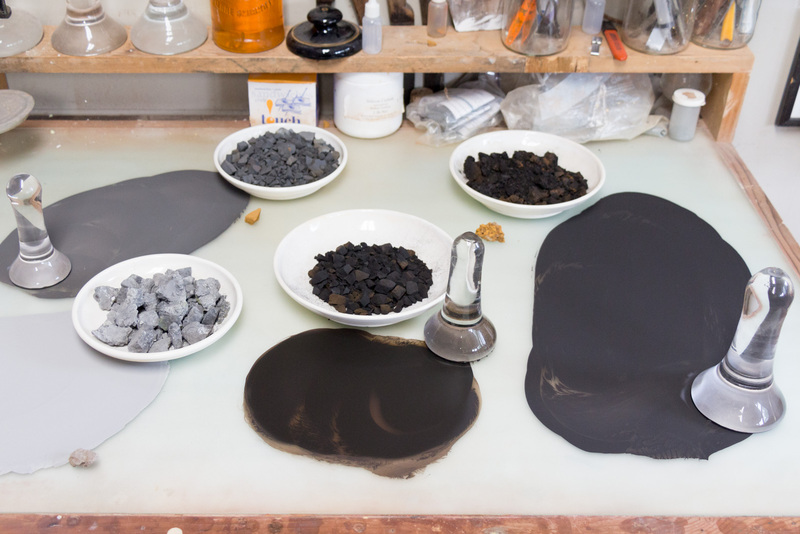 As I laid the ochre onto its bed of coals, a quick measurement indicated that these were somewhere between 315°C to 370°C (600°F to 700°F). Then I covered it up. The next morning, I removed the bones and original canisters from the firing pit, but I left the small sample of ochre in place and covered it with new coals. Going back to ancient times, a special ochre was created by burning it over several days. So, over the next three days I arranged to coals and ashes to keep the ochre at a constant temperature in the centre of the firing pit. As I checked on it day by day and rearranged the coals, I had a real sense of caring for something undergoing a metamorphosis inside its small metal cocoon. On the third day, a storm came through our village and released a deluge of water from the sky. Although the canister was still hot to the touch afterwards, I decided that the process was finished. Moving the ochres and bones I had burned into the studio I now began to disinter these colours. 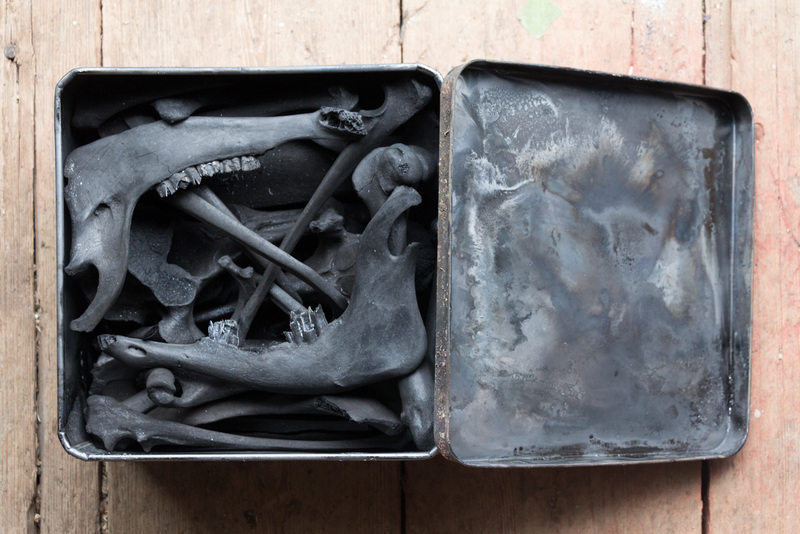 The first thing I opened was the burnt bones, which had stayed in their arrangement but were now a deep black. Everything was black, except for a fine outline of white around the teeth—giving them a look of sprouting out of the jaw bones. Although they were completely cooled, when the fresh air entered the tin a reaction was set off, and a quiet pinging began in the tin for quite some time. I don’t know why this happened, but holding the tin as these bones whispered about coming back into the world was very special. I opened the three larger canisters that had glowed bright, cherry red next. The ochres now ranged from a cool grey to a very warm black-brown. The clay from the river had been bisqued—I had to pulverize it before I could grind it into a pigment—producing a cool, opaque grey. The regular ochre had also greyed out a little, but in its own dark, warm way. And while the bog ore had turned to a brownish black, it was a warm luscious colour. Laying them all out on my grinding table, it seemed to me that some colours had fled from the warmth of the fire, while others had absorbed it. Last of all I opened the ochre that had been entombed in coals for three days. As I forced the canister open with a metallic squeal, the newly fired earth emerged as the most beautiful burnt sienna I’ve ever seen. It is warm, opaque and full of life. I can’t wait to paint a saint with this resurrected colour! With the firing done, the ochres have transformed and I’ll now go back to painting—my priestly role fulfilled, and with the experience granting me a deepened wonder for the world where I live. As the fire begins, its wild flames claw the sky above my head, and I have momentary fears of whether this wild element will be contained within the bounds I’ve set. 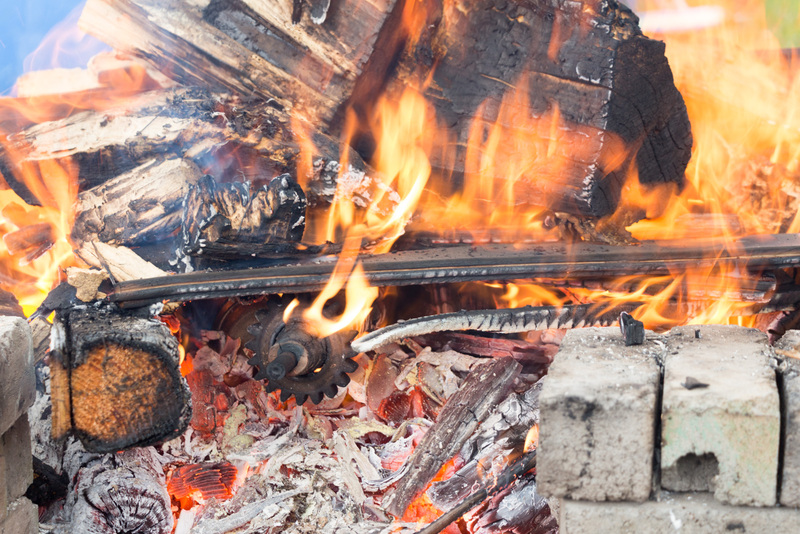 New wood is fed to the fire, requiring the shifting of wood, and the heat slaps my skin making it instantly brittle. The need to escape from this heat is instinctual, and leaves me momentarily senseless—I only come to myself, walking away aimlessly along the studio’s garden. How did Jacob ever wrestle the burning angel all night? As the flailing flames condense into a mass of coals, the fire’s heart appears and my sense of wrestling calms down. I begin encouraging it—hoping it will burn a little longer. Like people did thousands of years ago, I keep the ochre wrapped in ash—checking inside every morning and evening that red still flows across the black coals. It’s inside of this organ of the fire that I place my most precious ochre, then wait. The coals burn for three days, and then they stop. But, like the artist’s from time out of memory, my vigil is rewarded by the fire’s glow saturated in the ochre’s resulting warm colour. Awesome reading! Have fun spiting. Cheers!